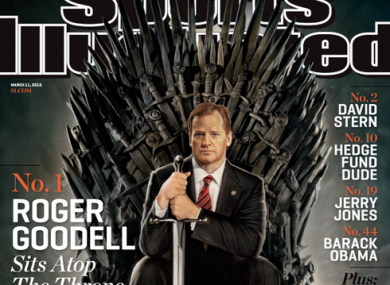 Sports Illustrated cast Roger Goodell in this Game of Thrones cover. 1. One of Roy Keane‘s most admirable qualities is that he will not have spent all morning Googling and hashtag-searching his own name on Twitter to gauge the level of hostility he has provoked among certainManchester United fans for “crimes” seemingly ranging from treason to apostasy. He simply couldn’t care. Let’s start as we mean to go on. There’s been plenty written about Roy Maurice Keane this week — this piece by Rob Bagchi on the Guardian about those United fans who feel betrayed by his comments post-Real Madrid is one of the more interesting. The Telegraph’s Jonathan Liew, meanwhile, reckons the Corkman came of age on ITV the other night. This is one of those pieces that American magazines do best; a long read by Don Van Natta Jr in ESPN The Magazine about NFL commissioner Roger Goodell and his reign at the top. 4. “When McIlroy quit the Honda Classic in Florida last week his first instinct was a Lyle-esque honesty. That was the beginning of his problems. Golf doesn’t like the truth in these circumstances. The establishment would sooner hear fibs. If McIlroy came in afterwards and said that his wrist was sore or his shoulder was hurt or his back was giving him gyp then he’d have stood a better chance of quelling the controversy than admitting the reality, which was that his game was wretched, his head was scrambled and that he’d just had enough for one day. Tom English in the Scotsman reckons golf can be ‘po-faced and two-faced’ at times. Another piece of our childhood slipped away this week when the Paul Bearer died; but more importantly — as Bleacher Report explain — William Moody passed away. Writing in The Guardian, Barney Ronay explains the increasingly ubiquitous phenomenon of football journalism. Email “The Sunday Papers: Keano, the Undertaker and Rory's tooth, here's some of the week's best sportswriting”. Feedback on “The Sunday Papers: Keano, the Undertaker and Rory's tooth, here's some of the week's best sportswriting”.